Rep. Ron DeSantis, right, and Tallahassee Mayor Andrew Gillum. So, we can at least all agree that Gillum is on the left end of a left-wing party and, therefore, that anyone from the center to the right in American politics will regard his policies as, at the very least, injurious to Florida’s — and America’s — economy. 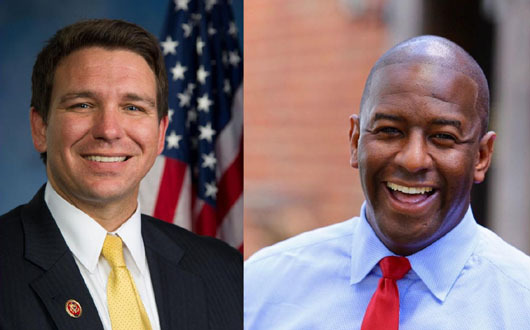 What, then, did DeSantis say that was morally objectionable? He said the socialist ideas of his opponent would monkey up Florida’s economy — which would be a nonissue were it not for Gillum being black. Therefore, according to the Democratic Party and the left-wing media, DeSantis used that term to send a “racist dog whistle” to fellow Republican racists. First, the Left fears that unless blacks continue to believe Republicans are racists, they will not overwhelmingly vote Democrat. And if they don’t, Democrats will not regain the White House for the foreseeable future. The same holds true for depicting Republicans and conservatives as women haters. There is no better way to persuade college-indoctrinated women to vote Democrat. And the same holds true for Latinos — Republicans must be continuously labeled “white supremacists” and “xenophobes” or they, too, may not reliably vote Democrat. Second, though most intellectuals are on the left, the intellectual foundation of left-wing beliefs is unbelievably weak. Leftism is almost entirely emotion-based. That’s another reason the Left smears conservatives and tries wherever possible to prevent conservatives from speaking in the university, on the internet and by the many big businesses in the hands of people on the left: Since leftists cannot debate conservatives, they have to smear them. America is the least-racist multiracial, multiethnic nation in world history. The Left’s constant need to locate racism where it doesn’t exist is proof of this.